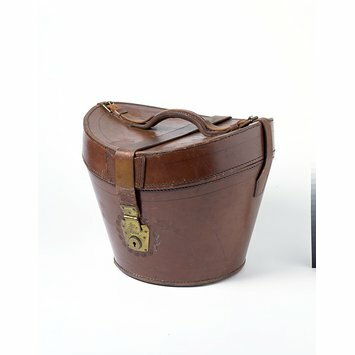 This hatbox is made of brown leather, with two leather straps with snap fastenings and a handle for transportation. It is lined with red grosgrain, a heavy, corded silk. Inside the bottom part of the hatbox is a top hat of black silk plush, lined with white satin. The top of the hat has a ventilation hole marked 'Extra Quality Trade Mark Dunlop & Co Reg. US Patent Office'. The top of the hatbox contains a gibus (a top hat with a collapsible crown, which came into fashion in the 1840s and was worn with evening dress) of black silk grosgrain lined with black silk marked 'Extra Quality Trade Mark Dunlop & Co., Copyrighted CBH'. The popularity of hats in Victorian Britain meant that a wide range of accessories was produced to assist with storage and cleaning. 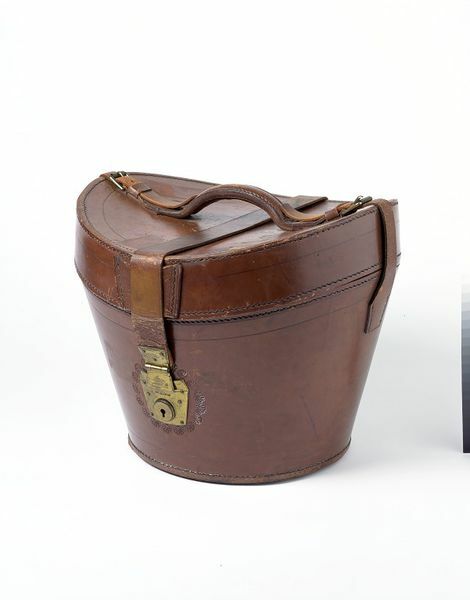 Hatboxes were used for travel as well as for storage. Many are covered in foreign stamps and luggage labels documenting their owners' travels. Some hatboxes included a storage space for a brush. Hat brushes were often used for advertising by hatters and were given away with new hats. They were designed to brush the nap of silk hats, to remove dirt or dust particles and improve the shine. They were often curved and usually had three rows of bristles. Some had five or six bunches of bristles protruding at right angles so that they could clean awkward corners. Black top hat, black opera hat and leather hat box. Top hat and opera hat with hat box, made by Dunlap & Co., New York, 1890-1899.